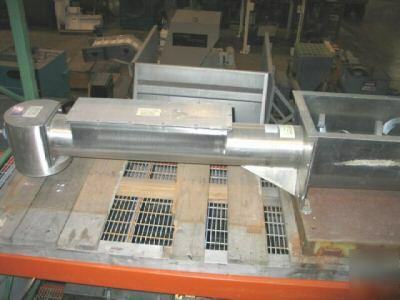 MODEL I40-T/2 , S/N 90437-01; 8 “ DIAMETER SCREW WITH HEAVY DUTY OVERWRAP IN FEED TROUGH SECTION; CENTER OF FEED TO CENTER OF DISCHARGE APPROXIMATELY SIX FEET; INLET TROUGH 16” X 29”; OUTLET IS 12” DIAMETER; OVERALL LENGTH OF EQUIPMENT IS 10”-4”. UNIT IS DRIVEN BY TENV MOTOR AND GEAR REDUCER, RELIANCE 3 HP DC MOTOR TYPE RPM III; 180 VOLT COMPLETE WITH SCR CONTROLLER. 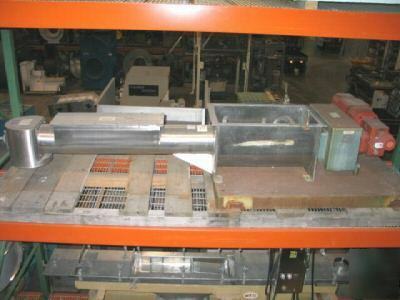 UNIT HAS HEAVY DUTY OVERWRAP AND FEED TROUGH SECTION. EXCELLENT CONDITION.